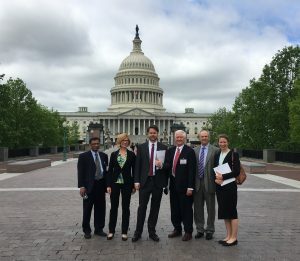 UVA Assistant Professor Dr. Anne Mills, resident Dr. Ashley Volaric, and fellow Dr. Brian Willis recently joined the College of American Pathologists (CAP) for the annual CAP Policy Meeting in Washington, D.C. 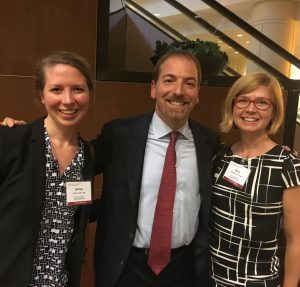 Highlights of the meeting included Keynote speeches from Former Senate Majority Leader Tom Daschle and chief political correspondent for “Meet the Press,” Chuck Todd. The meeting culminated with “CAP on the Hill,” a day spent advocating for healthcare access. This year’s advocacy focused on developing an appeals process when restrictions on Medicare reimbursement result in denials of reasonable and necessary tests and services. 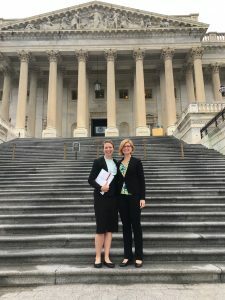 The UVA team was joined by community pathologists from across Virginia in meetings with the offices of Senators Tim Kaine and Mark Warner to discuss how our patients’ access to care is affected by current regulations. Drs. Mills and Volaric also met with members of the Women’s Caucus to discuss how pathologists contribute to women’s healthcare issues.